Below you will find a sample of my visualizations (images, movies and interactives). Images and movie files are hosted on Northwestern's Box storage, and please note that Box sometimes degrades the quality of the videos when previewing in the browser. To download the full resolution versions for images or movies from within Box (after clicking on a link provided below), please click the purple "DOWNLOAD" button near the top right corner. Use freely, but please give appropriate credit. 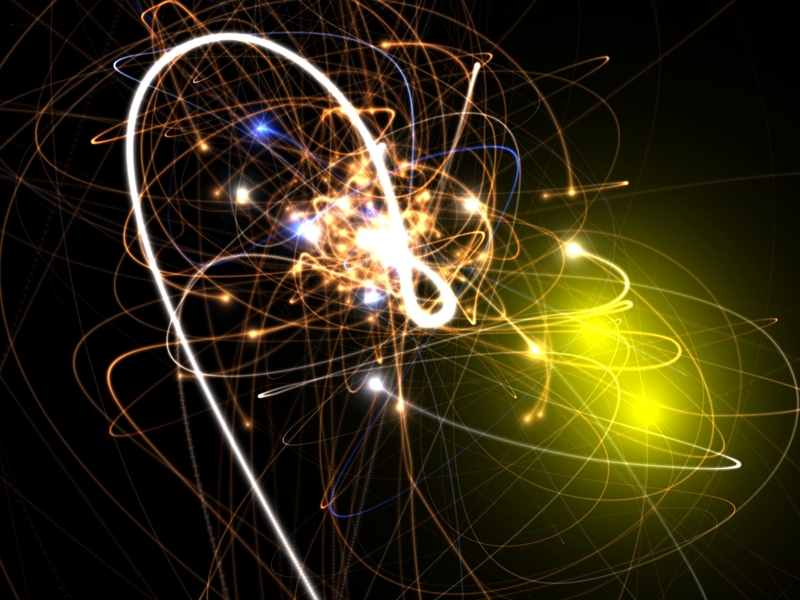 Firefly : Firefly is an interactive particle viewer designed for FIRE data, written in WebGL using the three.js library. 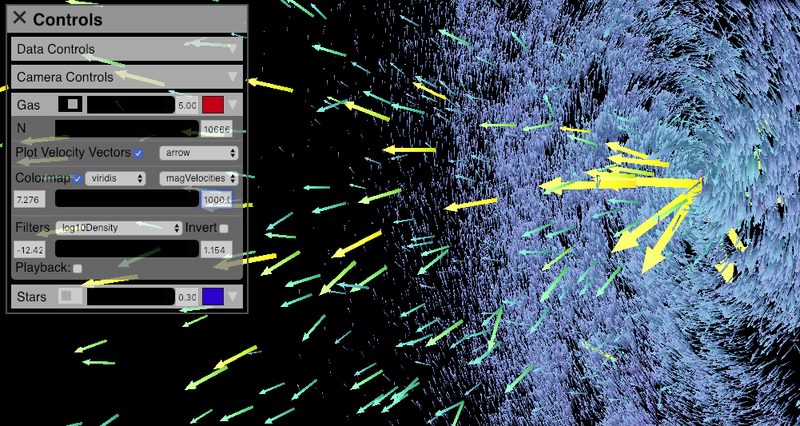 This interactive allows you to explore 3D particle-based simulation data in real time, with many options to change (i.e. filter) the data that is shown. There is also a stereo mode that will allow users to view the simulations in passive left-right 3D (with appropriate hardware). A live version is available here. The code is available on my GitHub page here. GaiaFly : GaiaFly is a modified version of Firefly that shows data from Gaia DR2. A live version showing the 3 million brightest stars is hosted here. The code is available on my GitHub page here. Credit: Created by Aaron M. Geller and Alex Gurvich, using hte three.js library. Please see our GitHub page for more information. 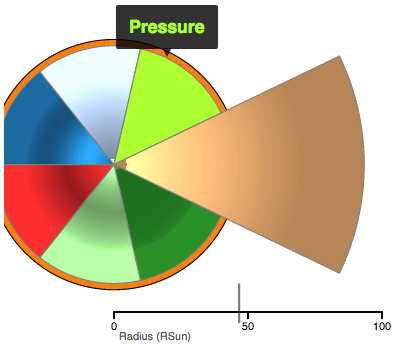 Adler's Aquarius Project : A WebGL visualization for the Adler Planetarium's Aquarius Project. The Aquarius Project is an Adler Planetarium program to search for a meteor that impacted in Lake Michigan on Feb. 6, 2017. In this online interactive, you start by viewing the Solar System two and a half years before the Aquarius Project asteroid enters the Earth's atmosphere. This is nearly one full orbit of the Aquarius Project asteroid. Orbits are color coded : white for the Aquarius project meteor; blue for Earth; yellow for the inner rocky planets (Mercury, Venus and Mars), red for the outer gaseous planets (Jupiter, Saturn, Uranus, and Neptune), purple for Pluto, and green for the asteroid belt. The asteroid is slightly enlarged and also circled in yellow for visibility. A live version is available here The code is available on my GitHub page here. Credit: This application was written by Aaron M. Geller and Maria A. Weber, using the three.js library. Mark Hammergren calculated the asteroid orbital elements. Patrick McPike contributed the asteroid design element. Please see our GitHub page for more information. Exoplanets in WebGL : As part of the Adler Planetarium's Kavli Fulldome Lecture Series, we developed an online interactive viewer for exoplanets. This particular interactive accompanied Dr. Lisa Kaltenegger's lecture: Are We Alone in the Universe?. In this interactive, you can explore real data from the Open Exoplanet Catalogue, and fly around the Galaxy to learn about when and how these exoplanets were discovered and view their architectures. A live version is available here as part of our Kavli Lectures website. The code is available on my GitHub page here. Credit: Created by Aaron M. Geller and Mark SubbaRao, using the three.js library. Scatter Viewer : This WebGL application is meant to connect with the output from N-body scattering codes, like < a href="https://sourceforge.net/projects/fewbody/files/" target="_blank">FEWBODY, though it can be used with any N-body style data. There are many options to tweak to appearance, including a stereo 3D option, and you can capture images and videos directly in the browser. Credit: Created by Aaron M. Geller, using the three.js library. D3 Light Curve Viewer : This D3 interactive allows the user to view and manipulate data from a light curve (e.g., for a variable star). This will eventually become part of our Zooniverse citizen science project "Stellar Sleuths". The live version hosted here, includes real light curve data for the RR Lyrae variable star, in red, and mock (testing) data in blue. In a future version, both the red and blue points will be for the same star, but showing data from different filters. 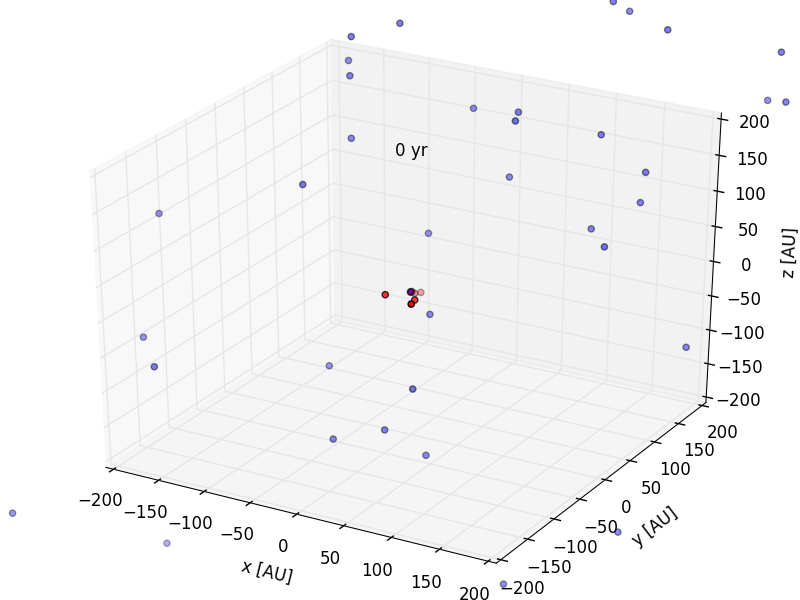 There is also a color-magnitude diagram showing a subset of stars from the Gaia DR2 data set, and a mock data point for this star. The code is available on my GitHub page here. Credit: Created by Aaron M. Geller and Adam Miller. Uniview Modules : I have developed many custom modules for the Uniview planetarium software, mostly for the Adler Planetarium's Kavli Fulldome Lecture Series, and often in collaboration with Mark SubbaRao. Below is a list of these modules linking to the respective GitHub pages. 3D model of a blazar, created in Maya and modified in Uniview with shaders. This was meant to represent the TXS 0506+056, which sent a neutrino observed as IceCube-170922A. Model of the IceCube neutrino detector, with data from the 170922A event. Neutron star - neutron star merger, including the graviational wave inspiral, the gamma-ray burst, and the Kilonova, This was meant to represent LIGO's GW170817 event. This module was developed in collaboration with Jeffrey SubbaRao. Large Magellanic Cloud, showing stars from Gaia DR2. This was used to accompany the SN1987a module. Evolving Sun, Earth and Venus; the Sun contains a cutaway showing the core Hydrogen region, from a MESA model. 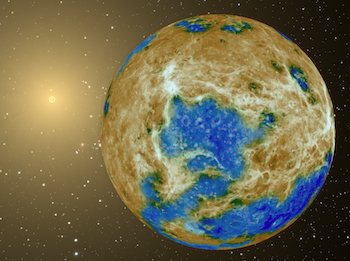 This module also contains an Earth, with atmosphere getting redder with increasing CO2 levels (red when Sun was young), and a Venus with imagined water on the surface (early times) and a (red) CO2 atmosphere growing at later times. GRACE satellite data, overlayed on a map of the Earth. GRACE measured local gravity on Earth, and this module can be used, e.g., to highlight dramatically decreasing ice thickness in Greenland. Changing glacier levels based on Vostok ice core sample CO2 measurements. Volcanoes and emissions over time, similar to this app. Pleiades N-body model, showing a the time evolution of a computer model star clusters simular to the Pleiades. More information on this is given below, under the heading "Dynamical Evolution of Star Clusters". 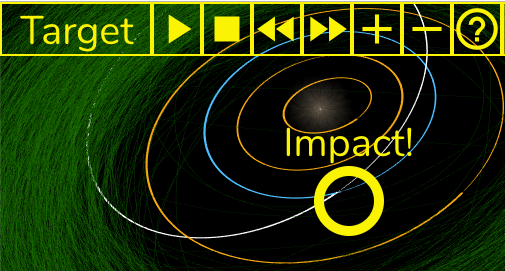 Future of our Solar System, based on a MESA model of our Sun, and my own calculations of the changes to the planets' orbits. More information on this module is given below, under the heading "The Late Evolution of Our Solar System"
Credit: Created by Aaron M. Geller, often with help from Mark SubbaRao (and sometimes others; see the descriptions in each module for details). Final Flight of a Neutron Star Pair: GW170817 from Birth to Merger in Galaxy NGC 4993 : This WebGL interactive shows possible locations in the host galaxy (NGC 4993) of the neutron star - neutron star binary merger, observed by LIGO as GW170817. 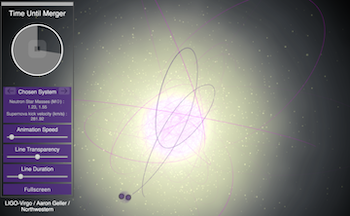 The interactive stars with a binary containing one neutron star orbiting the galaxy. 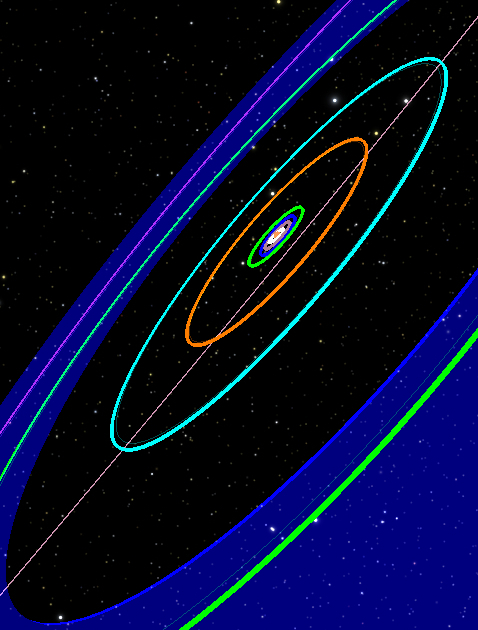 One orbit is shown for this system in green. Then the second supernova occurs, which creates the second neutron star, propelling the binary to a new orbit. 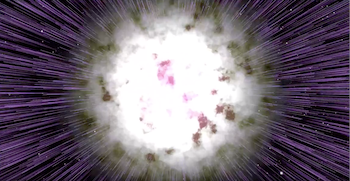 The two neutron stars then merge creating a gamma ray burst (jet) and a kilonova (flash). A live version is available here. The code is available on my GitHub site here. We also rendered a movie of this interactive, which was shown at the LIGO discovery press conference during Vicky Kalogera's talk. Credit: Interactive created by Aaron M. Geller. Orbit calculations performed by Mike Zevin. Black Hole Encounter : In late 2015, LIGO discovered gravitational waves emitted by two black holes (each with a mass of about 30 times that of our Sun) that spiraled together and merged about 1.5 billion years ago. Astrophysicists are now debating which is the most likely mechanism that can bring two black holes like those observed so close together. One important open question is: are the black holes born together, or do they find each other later in life? This image depicts the latter scenario, where multiple black holes are found within the heart of a dense globular star cluster (which contains hundreds of black holes and nearly a million luminous stars, simulated on a computer and observed here at an age of 2 billion years). During the very close gravitational encounter shown in this image, three black holes and one normal luminous star are engaged in a gravitational dance. One black hole and the normal star will eventually be flung out, leaving two black holes bound together in a very tight binary configuration. This black hole - black hole binary will later spiral together and merge, releasing gravitational waves similar to those observed with LIGO. Close encounters such as the one shown here are believed to happen frequently in globular clusters. In the image, the very strong gravity near the black holes bends the (normally straight) paths taken by the light emitted from the luminous stars, a phenomenon often called "gravitational lensing". Without the black holes, the viewer, who sits at the center of the globular cluster, would see a bright nearby blue-ish star straight ahead with a nearly uniform field of smaller, more distant, stars in all directions. This image won 1st place and the People's Choice Award 2017 Northwestern Scientific Image Contest! 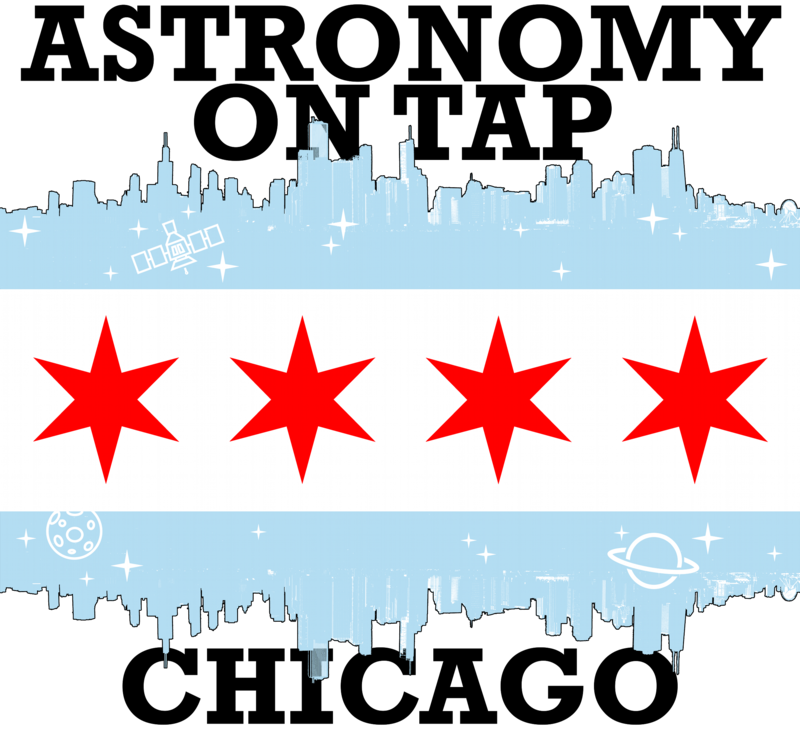 Credit: Image created by Aaron M. Geller. Monte Carlo globular cluster simulation performed by S. Chatterjee using the Northwestern CMC code. 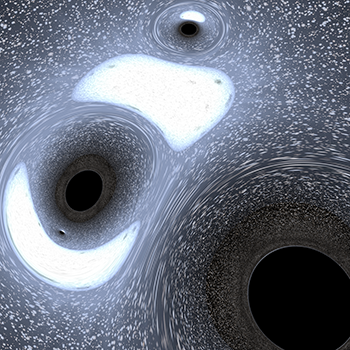 Black hole ray tracing simulation performed by A. Geller using GeoViS. When Worlds Collide : "Hot Jupiters" are Jupiter-like planets with orbits close to their host star. Their origins are debated, and some young planetary system may even host multiple Hot Jupiters. Here, we investigate a planetary system of two Hot Jupiters orbiting a Sun-like star. The system is born on the edge of instability, and over time, the planets' mutual gravitational perturbations increase their orbital eccentricities, leading to a dramatic collision that expels much of the planets' gaseous envelopes across the system. We study the initial orbit dynamics using an "N-body" gravitational integrator (Mercury), and the physical collision and thereafter using a hydrodynamics code (Starsmasher). 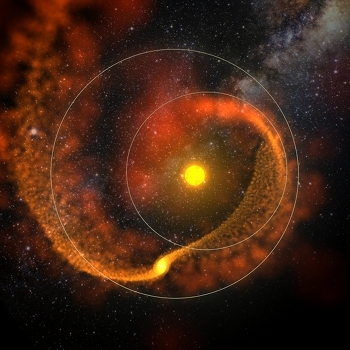 This image (created in Maya) shows the collision remnant nearly one orbit after the point of first contact. 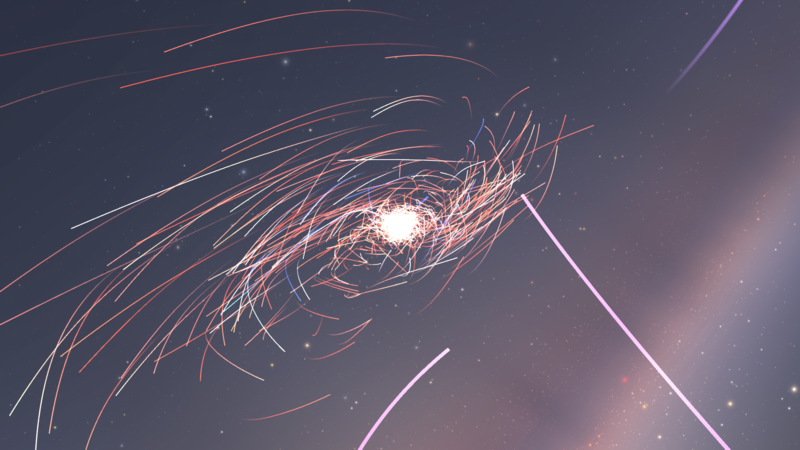 Solid lines show the planet orbits just before the collision. The color gradient represents the gas column density. 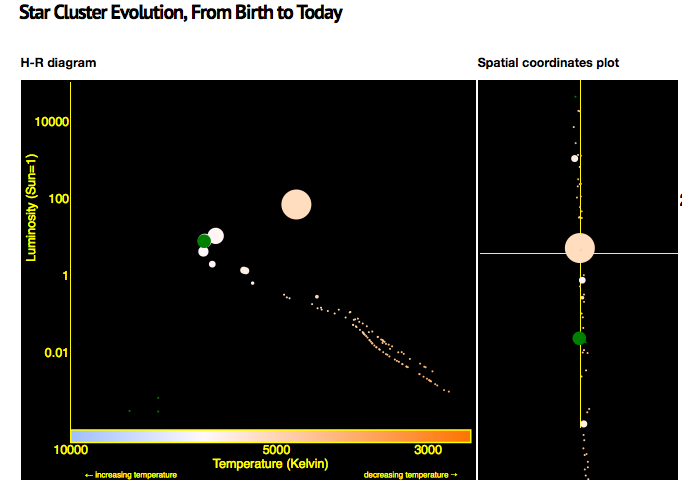 The background image shows the region observed by the NASA Kepler satellite, whose discoveries helped inspire this work. This image won the People's Choice Award and an Honorable Mention in the 2015 Northwestern Scientific Image Contest! Here it is on Northwestern's DigitalHub. And it is featured on Northwestern's Research Tools website. See also this version without the rings. Credit: Image created by Aaron M. Geller. Simulation performed by J. Hwang, with F. Rasio advising. 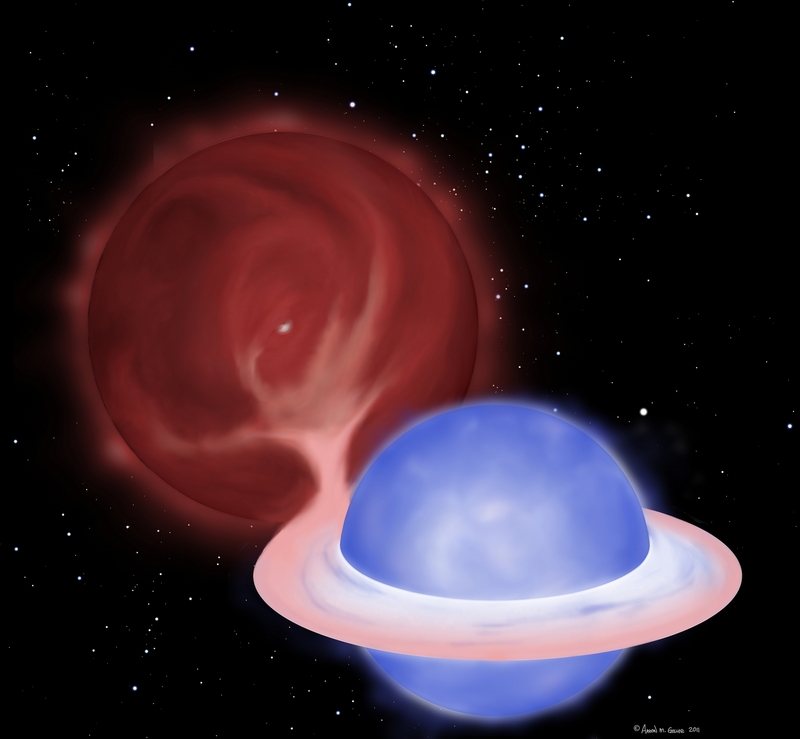 Birth of a Solar System : Gas-rich "proto-planetary" disks surround young, still forming stars, feeding them through accretion of dust and gas. These are the birthplaces of planetary systems.This image shows a simulation of a possible gas disk progenitor for the real exoplanetary system HR8799. Today, HR8799 has four, six-Jupiter-mass planets, 30 million years into their lives, surrounded by a diffuse disk of planetary debris. With computational fluid dynamics simulations such as the one depicted here, we study the early lives of planets, still embedded in their birth proto-planetary disk, in order to understand how planetary systems like HR8799 came to be. In this image (created in Maya), the color follows the temperature, with white tracing the hottest (and generally densest) material. Four planets are clearly visible as hot dense knots, accreting gas and creating spiral patterns in the disk. The background image is 30 Doradus, the most active star-forming region known in the Local Group of galaxies. Credit: Image created by Aaron M. Geller and A. Dempsey. Simulation performed by A. Dempsey. This visualization won 1st place in the proposal category, and was a finalist in the finished works category, in the 2015 Northwestern Data Visualization Challenge! 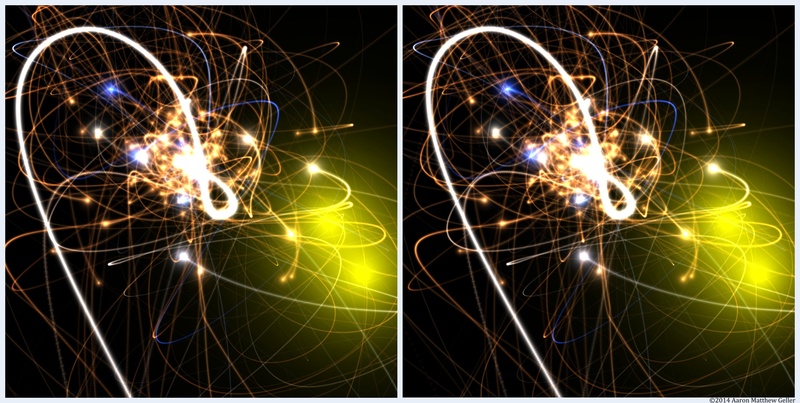 Credit: Interactive visualization created by Aaron M. Geller using MESA and d3. Dynamical Evolution of Star Clusters : I've been working to perfect this story of star cluster evolution and dissolution for many years (see all the different versions below). This particular movie was generated from an interactive visualization that I developed with Mark SubbaRao using Uniview. The interactive version can be shown on a Planetarium dome, or rendered into a movie (as shown here). We have a 3D version of this movie in the Space Visualization Lab at the Adler Planetarium. This movie discusses star cluster dynamics and evaporation, stellar encounters, black hole and neutron star formation, and the HR diagram. 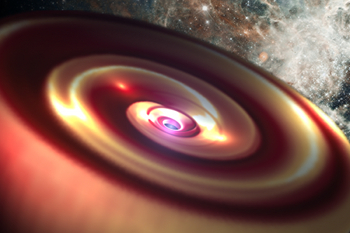 Credit: Created by Aaron M. Geller and M. SubbaRao, using Uniview; music, narration and audio by Aaron M. Geller; dynamical calculation with stellar evolution performed using the NBODY6 code. 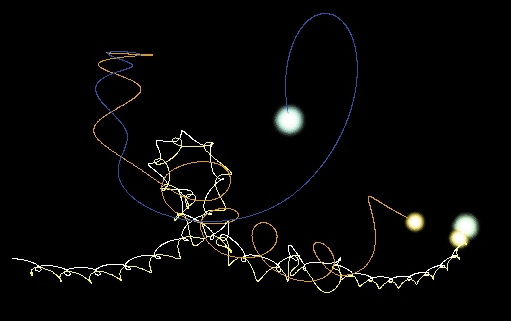 Credit: Interactive visualization by Aaron M. Geller and M. SubbaRao, using partiview; movie by Aaron M. Geller; dynamical calculation with stellar evolution performed using the NBODY6 code. This visualization uses the N-body code NBODY6 to track the stellar dynamics and stellar evolution of a 5000-star cluster from near-birth to an age of about 800 Myr. The early "flashes" are my attempts to represent supernovae. The dynamical and stellar evolution calculations were performed using NBODY6. Disclaimer: Stellar radii are not fully realistic (primarily because of the very large difference between dwarf and giant radii). Also the colors are slightly exagerated. This visualization was used in an online course through MIT's OpenCourseWare program : 6.S096 2014 Effective Programming in C and C++, taught by Andre Kessler . See Lecture 9.
Credit: Movie by Aaron M. Geller using IDL and MPEG Streamclip; dynamical calculation with stellar evolution performed using the NBODY6 code. You may also enjoy the "cross-eyed" stereo 3D image on the left, showing a 500-million-year time lapse of a model star cluster similar to our Sun's birthplace. Points show the stars' initial locations, and lines trace their motion under the force of gravity. Stellar surface temperatures are translated into the visible colors that we would see from real stars. The two yellow regions towards the right mark supernovae. Finally, the thick white line highlights the path of a Sun-like star as it escapes from the cluster. The simulation was performed using NBODY6, and the visualization was created with partiview. The two side-by-side images are from different vantage points, and can be combined to yield a "cross-eyed" 3D image in the middle. (See here for a useful tutorial.) I recommend clicking on (or downloading) the image to see the bigger version. Then try to align the white line first. If you are unable to see the 3D image please enjoy either 2D image or this 2D version. This image won 4th place in the 2014 Northwestern Scientific Image Contest! Credit: Image by Aaron M. Geller using partiview; dynamical calculation with stellar evolution performed using the NBODY6 code. 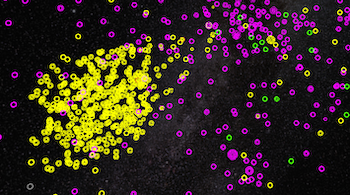 Here's a relatively new project that we're working on to visualize star cluster evolution using d3. You will see the evolution of the H-R diagram alongside the dynamical evolution of the star cluster, and you can interactively change the time in the model. Plus you can bring up real images of star clusters in our galaxy using World Wide Telescope. It's still a bit of a work in progress (e.g., you may need to zoom out in your browser to see the entire viz), but try it out! Credit: Aaron M. Geller produced the simulation using NBODY6. Ester Pantaleo coded this up into d3 and created the visualization. Mark SubbaRao and Aaron M. Geller conceived the idea. Stellar Encounters : Within star clusters, close encounters between single and multiple stars can be frequent and may lead to the production of exotic stars like X-ray sources and blue stragglers. I've created a few visualizations of interesting stellar encounters using the small-N-body code FEWBODY, and my own visualization software. In all of these movies, star sizes and colors are based on the actual radii and temperatures of the given stars (with some artistic license taken). Color-coded tails are shown to help keep track of the individual stars. During a collision, I slow down the encounter, and after the collision I pause and rotate the system, both to show more detail of the interaction. I include four examples below. If you have an idea for a different stellar encounter to visualize, please send me an email, and I'll do my best to create a movie of it! Evolution of the Color-Magnitude Diagram of a Star Cluster : On the left I link to a movie of the evolving color-magnitude diagram from our N-body model of the old open cluster NGC 188. 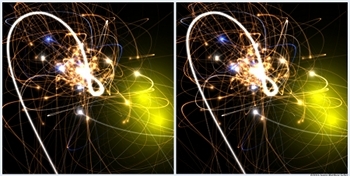 The snapshot on the left shows the cluster at 7 Gyr. 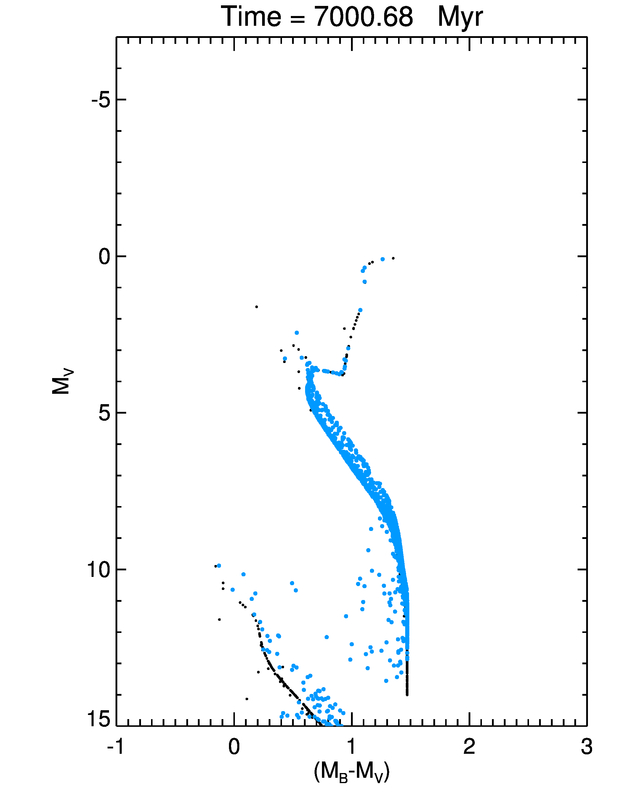 Binaries are plotted with blue points, and show the combined light of the unresolved system. Single stars are plotted in black points. The dynamical and stellar evolution calculations were performed using NBODY6, with some modifications to define the binary population and output format. This image was featured in news articles for our 2011 Nature Letter. Click here for a larger image, and if you want a full resolution version, please email me at the address given below. The Late Evolution of Our Solar System : This visualization was originally developed for the Adler Planetarium, and can be seen in their Space Visualization Lab as a 3D interactive show. Here is a movie of that visualization, which shows the evolution of our Sun and Solar System, including all eight planets and Pluto, from the time that the Sun ends its life on the main sequence (about 5 Gyr from now) until it becomes a white dwarf. You will see the Sun become larger and redder as it ascends the giant branch, shrink back down when it begins fusing Helium in its core, and then increase in size again as it makes its ascent up the asymptotic giant branch. You will also see the late thermal pulses during the asymptotic giant phase. Throughout this evolution, the Sun loses mass from a wind--losing nearly half its mass over the course of the simulation. This mass loss causes the planets to migrate outwards with time. For the inner planets, tides compete against this outward migration, as angular momentum is drawn from the orbit and transferred to the spins of the planets and Sun. The thick colored ellipses show the orbits of the planets as they evolve over time. Thin colored ellipses mark their initial orbits, for reference. Mercury and Venus are engulfed by the Sun has the Sun becomes a red giant. (The effect of tides is most evident as Venus is drawn into the Sun.) In this model, the Earth survives. Although it is worth noting that our understanding of the maximum radius that our Sun will reach on the red and asymptotic giant branches, and the strength of tidal dissipation, are both not well known. Slight changes to these parameters in our model can cause the Earth to also be engulfed by the Sun! You will also see the habitable zone, marked by the wide blue band, evolve with time. Inside the habitable zone, the temperature is such that liquid water can exist on the surface of a planet. As the Sun evolves onto the red giant branch, you will notice the habitable zone quickly move outwards, eventually moving well beyond the orbit of Neptune, due to the rapid increase in the Sun's luminosity. It is clear that, although the Earth is not engulfed by the Sun in this model, liquid surface water (and likely also humans) would not survive this stage of the Sun's evolution. Note, I am also working on a version of this in Uniview. Credit: Movie by Aaron M. Geller using partiview and ffmpeg; stellar evolution calculation performed using MESA; equillibrium tides following Hut (1981); dynamical calculation COMING SOON using Mercury; all linked together within AMUSE. 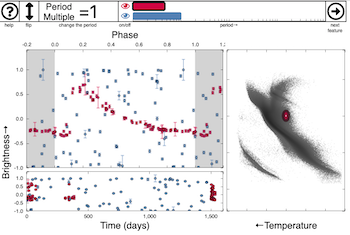 Planets in Star Clusters : We are currently developing a code within AMUSE that will model the dynamical evolution of planetary systems, including our Solar System, in realistic star clusters. This visualization uses the N-body code Huayno to track the dynamics of our Solar System within a VERY dense 100-star cluster. Here stellar masses are chosen from a Salpeter IMF, and the stellar positions and velocites are chosen from a Plummer model. Planets are shown in red, and stars are shown in blue. More recent versions of our code use Mercury and/or Huayno to model the planetary systems, ph4 to model the star cluster, and Bridge to link these systems together. 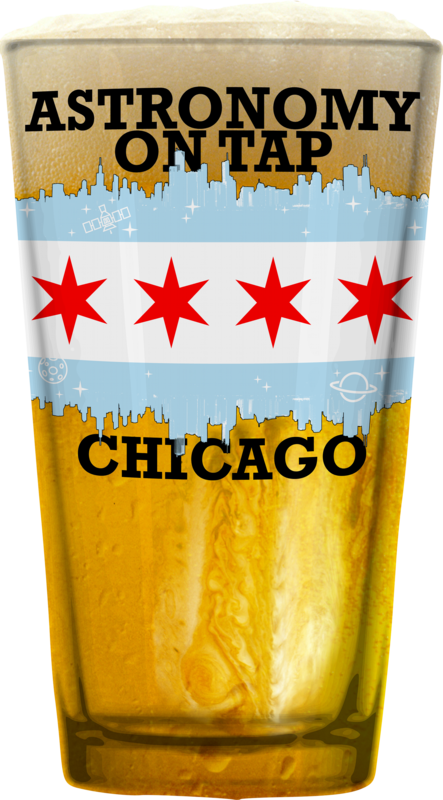 Astronomy on Tap Chicago : Northwestern/CIERA, the University of Chicago and the Adler Planetarium have joined forces for Astronomy on Tap Chicago! Each FREE event features accessible, engaging science presentations on topics ranging from planets to black holes to galaxies to the beginning of the Universe. I developed the logos and various advertising materials for our Northwestern/CIERA group. IDEAS Visualization Course : I teach a course on visualization for the Northwestern IDEAS graduate students. The current version is a two-week intensive course focussing on python+matplotlib, D3, and GMT, with a survey day that covers a very wide range of other software; we currently have materials to demo Bokeh, cartopy, datawrapper, ffmpeg, Illustrator, ImageMagick, ggplot2, Maya, ParaView, Photoshop, Plotly, Processing, PyOpenGL, R-shiny, seaborn, WebGL and x3dom. (This list is updated each year.) Students in the course develop their own visualization projects for their research. For more information, and to download course materials, please see my GitHub site here.